I’ve always been convinced that my grandmother has a direct line to God. But on the evening of Sept. 5, I prayed she would be wrong about her most recent revelation. That evening, I gave my grandma in Puerto Rico a call. She could sense my anxiety through the phone as I asked her about how she planned to prepare for Hurricane Irma. Did she have enough food? Emergency generators? What would she do if her home got flooded? News reports predicted mass destruction to the Caribbean, and my grandmother was a little too calm about it for my liking. Suddenly, that changed. “Ashley, I had a dream earlier this year that a big wave would come and wipe Puerto Rico away,” she said. “Don’t say that, Grandma!” I reacted. I hoped that she was wrong, and for a very brief time, she was. 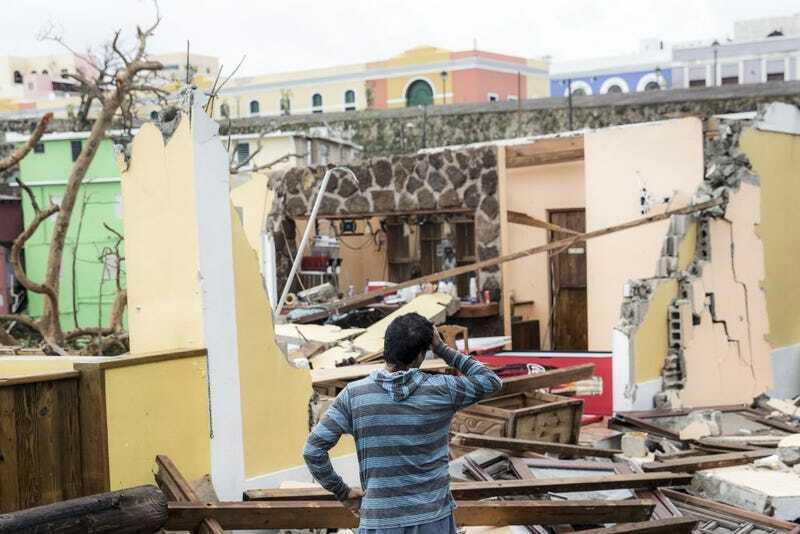 Hurricane Irma didn’t cause the destruction predicted for Puerto Rico, though it did cause extensive damage to islands like Dominica and Barbuda. Little did we know that just two weeks after Hurricane Irma would ravage other parts of the Caribbean, Hurricane Maria would make my grandmother’s nightmare about Puerto Rico come to life. My grandma is 73 years old. She turned 73 exactly nine days after Hurricane Maria made landfall. I haven’t been able to wish her a happy birthday because the hurricane destroyed the already frail electrical grid and nearly wiped out cellular reception across the island. We do know that my grandmother is alive, and there is some comfort in that. But my comfort subsides when I think about how the next few weeks of her life will unfold. There’s not much I can do to keep her from starving or getting dehydrated. I can’t buy her a plane ticket to come to the States because I can’t communicate with her. Sending her money is useless right now because banks aren’t open. Like 55 percent of Puerto Rican residents, my grandmother has no access to drinking water. This is 2017, and an island of 3.4 million U.S. citizens could go without electricity for six months. The stakes are incredibly high. But this situation didn’t become as dire as it is because of hurricanes Maria and Irma alone. My grandmother has lived in Puerto Rico all her life and is no stranger to losing power during big storms. She’s gone weeks without running water. It is her reality, and still it’s no easy road. Nearly 44 percent of Puerto Ricans live in poverty. And as major news organizations devote the majority of their hurricane coverage to the tourist destination and capital, San Juan, some of the poorest and most at-risk residents on the island of Puerto Rico and other islands throughout the Caribbean remain neglected. There’s a reason Puerto Rican residents remain so poor. It began with Christopher Columbus, and it’s never ended. It many ways, Puerto Rico is still a colony. After hundreds of years of killing and brutalizing Africans and Taino Indians through slavery and exploiting them for sugarcane and gold, Spain lost control of Puerto Rico to the United States. But colonial exploitation of the island continued after the U.S. took control in 1898, and continues today. What does colonialism look like? Colonialism looks like using Puerto Rico’s small island of Vieques as a bomb-testing site for more than 60 years, exposing its residents to cancerous and health-altering chemicals with no remorse. Colonialism looks like sterilizing a third of Puerto Rican women until the 1970s in an effort to make them enter the workforce. Colonialism is fighting in U.S. wars and not having voting power in presidential elections. Colonialism is being reminded of your debt to a country that helped create it while you are dying. It’s reminding you that no matter how many taxes you pay, your freedoms are negotiable. That your right to live is dependent upon how much money you owe Wall Street. It’s denying black and brown folks their human rights and telling them they got themselves there; that they’re too lazy to get themselves out of the mess and want everything done for them. No, Donald Trump didn’t create this mess, but his slow and negligent response to Puerto Rican citizens upholds the legacy of exploitation in a country that’s used and abused Puerto Rico for more than a century. My grandmother deserves better. I just hope she lives to see it.